Yesterday after our practice for the ordination of a new priest for the Diocese of Springfield in Illinois, a priest-friend of mine remarked that I hold a special distinction of the priests of my presbyterate: I am the only priest under thirty years of age. This distinction I shall keep for one more year. When Christ the Lord took on flesh and was born in Bethlehem of the Virgin Mary he took upon himself our humanity together with his divinity. He lived among us and taught us the way to the Father as he made the difficult and agonizing journey to Jerusalem. All the while his divinity remained veiled. The veil over his divinity was pulled back, as it were – his divinity was revealed - when he healed the sick; when he cast out demons; when he raised the dead; or when he multiplied the loaves and the fishes, but his divinity was not seen by all, nor was it seen all of the time. When the all-powerful God chose to come be with us he did not come with the blare of trumpets or the march of armies. He did not come as he deserved; rather he chose the way of poverty and humility, all to reveal to us the awesome power of his love. He came among us so quietly that he almost came unnoticed. In his death on the Cross, we see the fullness of his humanity and the depth of his great love for us. In his Resurrection from the dead we begin to see more of his divinity, but at the same time we see his humanity given greater glory as he stayed among these past forty days. In his resurrection, he reveals more of his majesty to us, but in his ascension into heaven we behold the fullness of his divinity. The meaning of this last gesture of Jesus is twofold. Above all, ascending on “high,” he unequivocally reveals his divinity: He returns to where he came from, that is, to God, after having fulfilled his mission on earth. 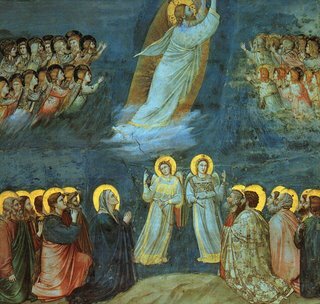 Moreover, Christ ascends to heaven with the humanity he had assumed and which has resurrected from the dead: That humanity is ours, transfigured, divinized, made eternal. The Ascension, therefore, reveals the “supreme vocation” (Gaudium et Spes, no. 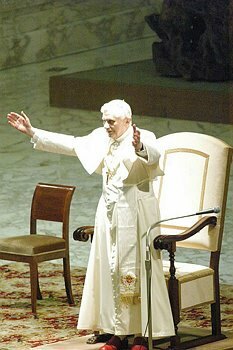 22) of every human person – called to the eternal life of the kingdom of God, kingdom of love, light and peace (Pope Benedict XVI, Regina Caeli Address, 21 May 2006). But how do we enter into this kingdom? After the Last Supper Jesus said to the Apostles, “And if I go and prepare a place for you, I will come back again and take you to myself, so that where I am you also may be. Where [I] am going you know the way” (John 14:2-3). Today he says this to each of us as well. Having ascended to the Father he prepares a place for us, but we must seek to follow after him. We must desire to be where he is. He will not force us to be with him; we must desire it and we must have faith in him. We must implore for the gift of this faith. To this statement of Jesus Thomas demanded, “Master, we do not know where you are going; how can we know the way?” (John 14:5). Do we not say the same to Jesus: “Lord, where have you gone? Why have you left us?” Jesus answers this question, which we all pose to him, saying, “I am the way and the truth and the life. No one comes to the Father except through me” (John 14:6). He has not abandoned us; rather, he is our hope, for he shows us the way to the Father. After watching in bewilderment Jesus ascend to the Father, the Apostles continued “looking intently at the sky” (Acts 1:10) and “standing there looking at the sky” (Acts 1:11). It is as though they stand there asking again with Thomas, “Master, how can we know the way?” They see Jesus ascend in his glory. They know where he has gone but they do not know quite how to get there, they do not quite know how to follow him. The way to heaven, the way to the Father, the way to eternal life is no thing, it is a person; the way is Jesus Christ! Knowledge of the Savior and a mature faith in him is the way to heaven, is the way to follow him; in short, what is needed is a faithful relationship with Christ Jesus, nothing more, nothing less. We are reminded again of the Holy Father’s words: “Being Christian is not the result of an ethical choice of a lofty idea, but the encounter with an event, a person, which gives life a new horizon and a decisive direction” (Deus Caritas Est, 1). Today we witness where Jesus has gone. This is the new horizon we are given and the decisive direction. Our new horizon, our decisive direction, is the ascension of the Lord. We see him “lifted up” (Acts 1:9) into heaven and we know that today “God mounts his throne amid shouts of joy; the LORD amid trumpet blasts” (Psalm 47:6). “We rejoice that Christ our savior has taken his place at the right hand of the Father, because where he has gone, we hope to follow” (Pope Benedict XVI, Regina Caeli Address, 21 May 2006). Let us then not be found staring into the sky wondering where it is that Jesus has gone and pondering how it is that we are to follow. No, we know the Way! The Way knows us and loves us and calls us to himself. Let us then yield to the power of his love. Let us embrace the power of the Cross and resurrection so that when he comes again with the angels and the saints we may be found worthy to share with him eternal glory. Amen. Yesterday, in his General Audience address, the Holy Father Pope Benedict XVI continued his powerful reflections on the person of Saint Peter the Apostle. 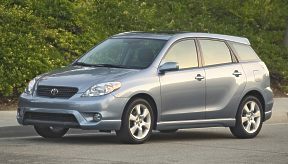 His was still an initial faith, a journeying faith. It would come to true fullness only through the experience of the paschal events. But, nonetheless, it was already faith, open to a greater reality -- open above all because it was not faith in soemthing, but faith in Someone: in him, Christ. The school of faith is not a triumphal march, but a journey strewn with sufferings and love, trials and faithfulness to be renewed every day. Like Peter, w e follow willingly after the Lord and we also deny the Lord and betray him. But we can take courage and consolation from the example of Peter because he did not let his failings stand in the way of his following after Christ. Rather, through his failings he came to know, in a more profound way than before, the love of Christ. Jesus asks Peter the first time: "Simon . . . do you love me ('agapas-me')" with this total and unconditional love (cf. John 21:15)? 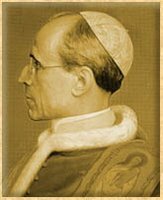 Before the experience of the betrayal, the apostle would certainly have said: "I love you ('agapo-se') unconditionally." Now that he has known the bitter sadness of infidelity, the tragedy of his own weakness, he says with humility: "Lord, I love you ('filo-se')," that is, "I love you with my poor human love." Can any of us love Jesus with more than our poor human love? What else have we to offer him? Christ insists: "Simon, do you love me with this total love that I want?" And Peter repeats the answer of his humble human love: "Kryie, filo-se," "Lord, I love you as I know how to love." The third time Jesus only says to Simon: "Fileis-me? ", "Do you love me?" 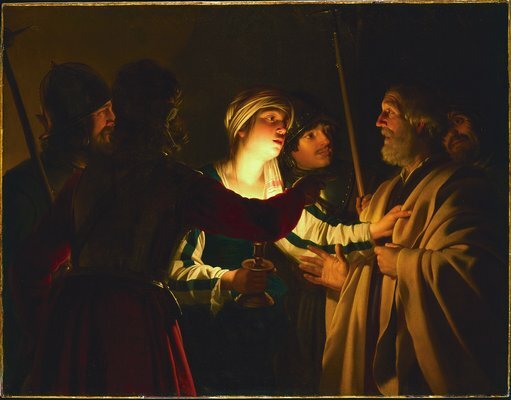 Simon understood that for Jesus his poor lve, the only one he is capable of, is enough, and yet he is saddened that the Lord had to say it to him in this way. ... It would seem that Jesus adapted himself to Peter, rather than Peter to Jesus! Such is the powerful and tremendous beauty of the love of Christ, who loves us as we are and calls us to grow in love, while at the same asking only of us the love that we can give. Thank you, Holy Father, for these beautiful reflections! I eagerly await your continuing reflections on the Apostles! After repeated requests for decency went unheeded at a recent graduation ceremony, the Most Reverend Michael Jarrel, Bishop of Lafayette, walked out of the ceremony. Parents, relatives, and friends persisted in cheering in the form of "hoots and hollars" for their graduates, despite instructions to hold their applause and cheers until all graduates received their diplomas. Like many of you, I am sure, I, too, have witnessed such debacles and I find them very distasteful, self-centered, and immature at best. To refrain from such ridiculous and obnoxious behavior seems a fair request, and a decent one, that adds dignity and respect to the ceremonies. I have great respect for the graduates. They were perfect young ladies and gentlemen. They did all that was asked of them by the school. I believe that they wanted a dignified ceremony and one not interrupted by rude behavior by others. Thirty years ago it was the graduates who created disruptions. Today's graduates are models of good behavior; the problem is in the audience. What I did was for the sake of the graduates in future years (emphasis added). It is high time somebody said such a thing! Way to go, Bishop Jarrel! Keep up the good work! In a letter to Father Peter-Hans Kolvenbach, Superior General of the Society of Jesus, the Holy Father Pope Benedict XVI reiterated a centrul truth of the Christian faith, saying, "In fact, being Christian is only possible with our gaze fixed on the cross of our Redeemer." So many who would call themselves "Christians" - largely in the Western world - are promoting a version of "Christianity" that seemingly seeks to avoid the cross of our salvation in everyday faith and living, but such a vision clearly is false and dangerous. The letter, written on the occassion of the fiftieth anniversary of Pope Piu s XII's Encyclical Letter Haurietis Aquas (On Devotion to the Sacred Heart), centered on the devotion to the Sacred Heart of Jesus. Praising this devotion, Pope Benedict XVI reminds us that "gazing at the side pierced by the lance, where shines God's boundless will for salvation, cannot then be considered as a passing form of veneration or devotion. The adoration of God's love, which found historical-devotional expression in the symbol of the pierced heart, remains irreplaceable for a living relationship with God." In reflecting on the call of the Savior, Pope Benedict XVI recalled that "the experience of God's love is lived by man as a 'call' to which he must respond." Let us respond generously and with loving hearts to this invitation and so fulfill the Scripture, "They shall look on him whom they have pierced" (John 19:37). 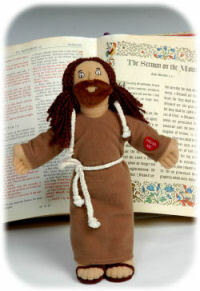 The other day a friend sent a link my way that I thought I would share with you: Talking Bible Dolls. To my mind, they seem the epitome of tackiness and religious "fluff," but what do I know? The three dolls are to represent Jesus, Moses, and - so as not to leave out little girls - Esther. I might have thought to make a doll out of Mary to go along with Moses and Jesus, but again, what do I know? While Moses recites for us the Ten Commandments, Esther tells us about herself. Jesus, meanwhile, recites various passages from the Scriptures for us. You can make them talk by pressing their red hearts. How sweet. I must say that today has been quite a lovely and - for the most part anyway - refreshing day. Without having to teach class in the afternoons I now have a good chunk of free time in the day that I have not had in many months, which has resulted in the possibility to get to projects that have been waiting to be attended. This morning as I was shopping about for various necessities, I found a bookcase that I liked and thought would work well in my library in the rectory. I have been searching for a bookcase for some weeks now, without success (obviously). After purchasing the bookcase, loading it into my Toyot a Matrix (which is excellent for hauling large objects around), and returning to the parish I lugged the bookcase into the rectory foyer with the help of our Administative Manager (summers are quieter for him, too). I then spent the next two hours in the successful attempt to put the pieces together in the appropriate order (that part was a bit tricky as the directions were none too clear). However, I finally finished the project and ate some pizza. After some delicious slices of pepperoni (left over from a meeting last night) I returned to my library and began the very peaceful and relaxing process of transferring books from one shelf to another, resorting books, and finally - after some three months - taking books from the ever-growing pile on the floor to place them properly on shelves, where, as everybody knows, all books belong. I still have a bit more work to do in the library, including the hanging of various decorative pieces and some organzing to the workspace. When I finish this project I will take a picture of my library and post it - if I remember. And don't forget, as Cicero once said: "A room without books is like a body without a soul." Although I have very much enjoyed teaching at the high school of my parish, I am quite happy to say that the school year is now officially over. Last evening, we graduated forty-five seniors and - as of this moment - we have enrolled sixty-one freshmen for the coming school year. Even as classes at the high school drew to a close, my preparations were only beginning. This summer I will return to the Liturgical Institute of the University of St. Mary of the Lake to resume my studies toward the Licentiate in Sacred Theology. The Lord give you peace! The Lord is risen from the dead! Alleluia, alleluia! The Lord is risen indeed! Alleluia! During my final year of studies and preparation for the priesthood at Mundelein Seminary, I enrolled in the Liturgical Institute of the University of St. Mary of the Lake and began studies toward a Licentiate in Sacred Theology with an emphasis in sacramental theology (this degree is somewhat higher than a Masters degree). I completed the first year of studies during my final year in the seminary and I now have the second year yet to complete. With the permission of Bishop Lucas, I have discussed with Msgr. Enlow the possibility of my returning to the Liturgical Institute this summer to resume these studies from June 12th through July 14th, with the aim of completing them in the summer of 2007. Msgr. Enlow has kindly granted me permission to resume these studies this coming June and July. In my absence, Fr. Carl Schmidt and Fr. Ben Meyer have graciously offered their sacramental ministry to the parish until I return. Please know that my commitments in the parish – particularly weddings – I will keep. As such, I will be back in the parish about every other weekend. Fr. Schmidt and Fr. Meyer will celebrate Masses during the week and on many of the weekends. I sincerely apologize for any inconvenience my absence may cause, but at the same time I know that these studies will only enhance my future ministry and teaching. I assure you that you will all remain in my prayers while I am away this summer and I ask your continued prayers for me. As Saint Francis of Assisi encouraged his brothers so I encourage you: Praise and bless my Lord, and give thanks to him and serve him with great humility. I am very much looking forward to my return to studies; I feel I am an academic at heart. It is this passage from the First Letter of Saint John that gave rise t o Pope Benedict XVI’s first Encyclical Letter, Deus Caritas Est, God is Love. In this beautiful and moving reflection on the God who loves, the Holy Father reminds us that the foundational tenet of the Christian faith is this very passage, that “God is love” (I John 4:8). In fact, this belief and truth is expressly unique to Judaism and Christianity; in terms of the religions of the world, it is something entirely new and unheard of. the whole world comes into existence by the power of his creative Word. Consequently, his creation is dear to him, for it was willed by him and “made” by him. The second important element now emerges: this God loves man (Deus Caritas Est, 9). In the ancient world the notion that God would love humanity seemed absurd and bizarre at best. Today, too, many people are tempted to believe the same. How could it be that God loves mankind, they ask. Look at what people do to one another, look at how people even ignore their God. How could God possibly love man? Even worse, some people go so far as to ask, “How could God love me?” To this very question Jesus responds clearly, “As the Father loves me, so I also love you. Remain in my love” (John 15:9). It is true to say that we do not deserve the love that the Lord has for us, but it is precisely here that the beauty and wonder of this love is made manifest. “In this is love: not that we have loved God, but that he loved us and sent his Son as expiation for our sins” (I John 4:10). The real novelty of the New Testament lies not so much in new ideas as in the figure of Christ himself, who gives flesh and blood to those concepts – an unprecedented realism. In the Old Testament, the novelty of the Bible did not consist merely in abstract notions but in God’s unpredictable and in some sense unprecedented activity. This divine activity now takes on dramatic form when, in Jesus Christ, it is God himself who goes in search of the “stray sheep”, a suffering and lost humanity (Deus Caritas Est, 12). Can there be any greater wonder than this? People often say to me that religion is boring, and by this they mean Christianity. Whenever they say this I have to wonder if they have been even the slightest bit of real attention throughout their entire lives. Can anything be more exciting than this? Purely out of love God created us and fashioned us for himself. Purely out of pride we sinned against him and forfeited the graced relationship we had with him and were thereby condemned to death. Even so, God never stopped loving us. We might even say that his love even intensified as he continually lovingly called us back to himself, even as we continually turned away. But then, in the fullness of time, God did something seemingly unimaginable: he took on flesh and blood for us sinners, to redeem us and save us, and to restore our relationship with him. Such is the power and the depth of his love! Even when we did not love him he still loved us! So great is his love for us that, seeing us in the dark misery and pain of sin and death, forever separated from him, he sent his only Son, Jesus Christ, to atone for our sins. In Christ Jesus we learn firsthand that, as the only Son of God says to us, “no one has greater love than this, to lay down one’s life for one’s friends. You are my friends…” (John 15:13-14). In the Christ Jesus, “The Lord has revealed to the nations his saving power” (Antiphon, Psalm 98). Amen. Alleluia! Today we celebrate not only this fourth Sunday of Easter, this “Good Shepherd Sunday;” we also celebrate today the forty-third World Day of Prayer for Vocations because today Jesus says, “I am the good shepherd, and I know mine and mine know me, just as the Father knows me and I know the Father; and will lay down my life for the sheep” (John 10: 14-15). Through his prophet Jeremiah, the Lord also promises us, “I will give you shepherds after my own heart” (Jeremiah 3:15). These are beautiful words the Savior says to us today and they are comforting words, for we cannot truly “know” another person unless we first love them. We may think that we know someone whom we do not love, but what we really mean is that we know about them; we do not – in reality – know them personally. We do not know their thoughts or true concerns, their worries, fears, and loves. Jesus says to us with confidence and with authority: “I know mine and mine know me.” He knows us through and through because he loves us and it is because he loves us that he reminds us, “[I] will lay down my life for my sheep.” This is the very reason he has come to us, to show us the depth of the Father’s love and to call us back to him. “[I]n Jesus Christ, it is God himself who goes in search of the ‘stray sheep’, a suffering and lost humanity” (Pope Benedict XVI, Deus caritas est, 12). He comes among us and lives with us. He listens to us, he encourages us, he challenges us, he calls to repent and to turn from sin and he loves us. He loves us like no has ever loved before and he loves like no one will ever love again. He picks us up – wounded, broken, and in pain as we are – and places us upon his shoulders. He carries us all the way to the Cross, all because he loves us. And he invites certain men and women to join him in this act of love, in this act of service. Jesus cannot know us any more deeply than he already does because he loves us perfectly and completely. 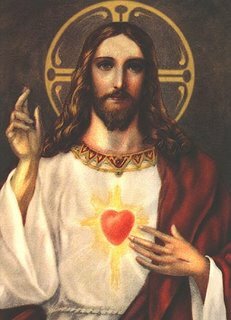 We, on the other hand, can always know Jesus more deeply because we can always love him more profoundly. This side of heaven, our love for him will rarely be perfect. Nevertheless, he calls each of us to know him and to love him and so to become one with one. God’s will is no longer for me an alien will, something imposed on me from without by the commandments, but it is now my own will, based on the realization that God is in fact more deeply present to me than I am to myself. Then self-abandonment to God increases and God becomes our joy (cf. Psalm 73 :23-28) (Deus caritas est, 17). My will becomes one with God’s will for me because I have come to know and experience his marvelous love, a love which knows no limits. In knowing his love I come to learn that he desires my happiness and joy – this is his will for my life and only in him will any of us ever be truly happy and joyous. it should never be doubted that Christ continues to raise up men who, like the Apostles, leaving behind all other work, dedicate themselves completely to the celebration of the sacred mysteries, to the preaching of the Gospel and to pastoral ministry” (Message for the 43rd World Day of Prayer for Vocations). Still today the Lord calls men in this very parish to serve him as priests and deacons, just as he calls men to serve him as consecrated brothers and as he calls women to serve him as consecrated sisters. This is a faithful parish and a vibrant parish. The faith is alive here, and yet there has been no priestly vocation to come from this parish in quite some time. And so the question must be asked, “Are we doing enough? Are we doing what the Lord truly asks of us? Are we living the faith as we should? Is there more the Lord asks of us?” Fifteen years – twenty years – since the last ordination from this parish is simply too long. I can say with great certainty that I would not be standing before you today, I would not be a priest of Jesus Christ, if it were not for the parishioners of my home parish in Quincy. These faithful men and women have a great love of the Church and of priests, as do you. These men and women saw something in me when I was in high school and they thought the Lord was calling me to the priesthood and so they told me; in fact, they repeatedly told me. Little did they know that at this very same time I, too, believed the Lord was calling me to the priesthood. Even so, without their invitation, without their support, without their enthusiastic encouragement, I would not have had the courage to pursue the priesthood, feeling myself unworthy of such a sacred calling. And indeed I am unworthy of the priesthood – as is every priest; but as the Holy Father reminds us, “Weaknesses and human limitations do not present an obstacle, as long as they help make us more aware of the fact that we are in need of the redeeming grace of Christ” (Message for the 43rd World Day of Prayer for Vocations). With this in mind, then, I challenge you to ask the Lord to let you know which young men in this very parish he is calling to serve him as priests and deacons. Ask him, too, to tell you whom is calling to serve him as consecrated men and women. I am watching several young men and women – and have been for some time – whom I believe the Lord is calling at this very moment. Many of them know who they are and so do you. These are the young men and women with whom you live, work, study, and play. You know their qualities and characteristics and you have a sense whether or not the Lord is calling them. When was the last time you extended the invitation to a young man to consider the priesthood or to a young woman to consider the consecrated life? Vocations are nourished, supported, and sustained through the parish; vocations do not simply fall out of heaven. The Lord raises up men and women to serve him and his Church through the communities of faith we call parishes and families. Vocations must be supported, they must be talked about, they must be encouraged if those whom the Lord calls are to hear his call and to respond to his call with generosity and with love. Already on the shores of the Sea of Galilee, many allowed themselves to be won by Jesus: they were in search of healing in body or spirit, and they were touched by the power of his grace. Others were chosen personally by Him and became his apostles. We also find some, like Mary Magdalene and others, who followed him on their own initiative, simply out of love. Like the disciple John, they too found a special place in his heart (Message for the 43rd World Day of Prayer for Vocations). Let us then always encourage and invite young men and women to offer their lives to the Lord as priests, deacons, and consecrated men and women. Lord, give us shepherds to lead us!